At the end of the year, when all you want to do is to laze by the pool or the beach, or by the pool and by the beach, you just want to eat at the closest restaurant by the pool or the beach (I know, I know, this sentence is long and boring). That is how we ended up at Isla Contoy the restaurant in Fiesta Americana Grand Coral Beach Cancun (in the Hotel Zone). It’s mainly a seafood restaurant but has a salad bar. The menu has limited vegetarian items, yet offers pretty good service and food overall. We got the Tacos Dorados and the Shrimp Quesadilla. 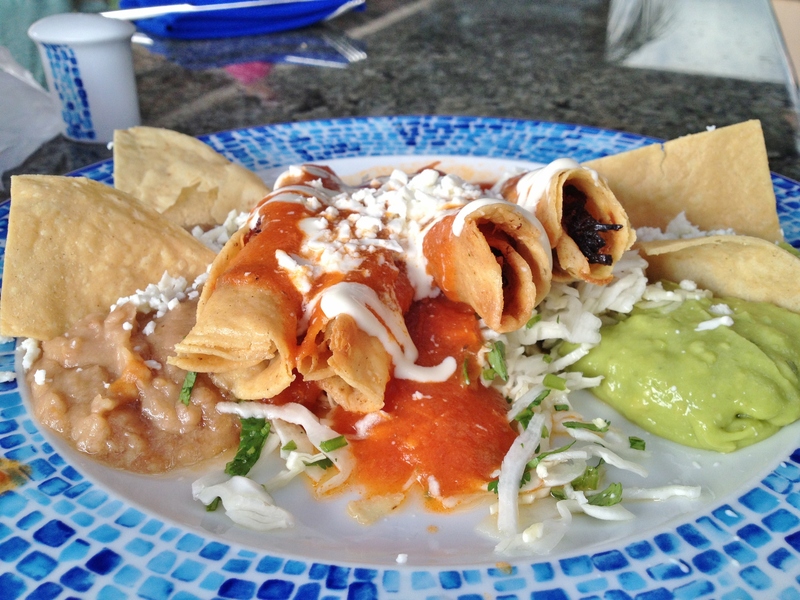 The Tacos Dorados were hard shell tacos with red sauce, cheese and cream. We could choose either chicken or beef filling for the tacos and we chose the chicken filling. The tacos were crispy and crunchy, just as we expected them to be. The red sauce was mildly spicy and full of flavor. The tacos were also served with some refried beans and guacamole (more like an avocado paste with salt and lots of lime juice). My favorite part of this dish was the bed of shredded cabbage and cilantro with lime juice and red sauce that made me feel like I was eating something healthy, although the tacos were fried. The shrimp quesadilla was served with a side of frisee, shredded carrots, and some guacamole (again, an avocado paste with fresh cream / cheese sprinkled on top). What’s not to like in a warm tortilla filled with melted gooey cheese mixed well with small pieces of well flavored, buttery, shrimp? Mexican dry noodle soup – the description says that this dish has noodles in tomato sauce served with cream and cheese. How this description translates to a dry noodle soup is beyond my comprehension, and isn’t a “dry soup” an oxymoron? 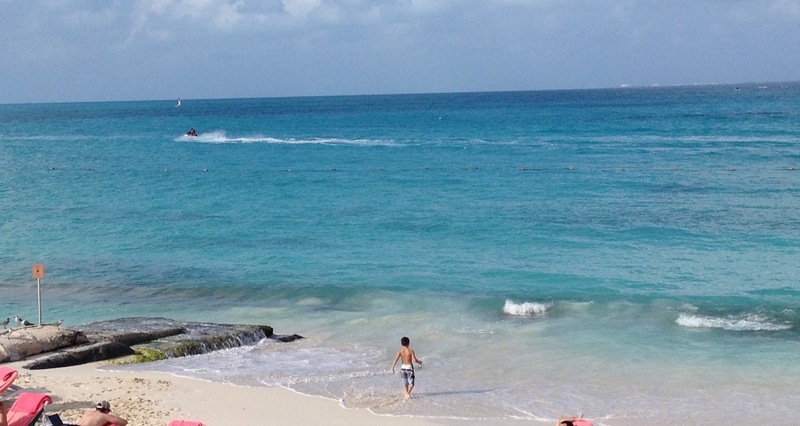 Why would you go to Isla Contoy in Fiesta and Americana Grand Coral Beach, Cancun? 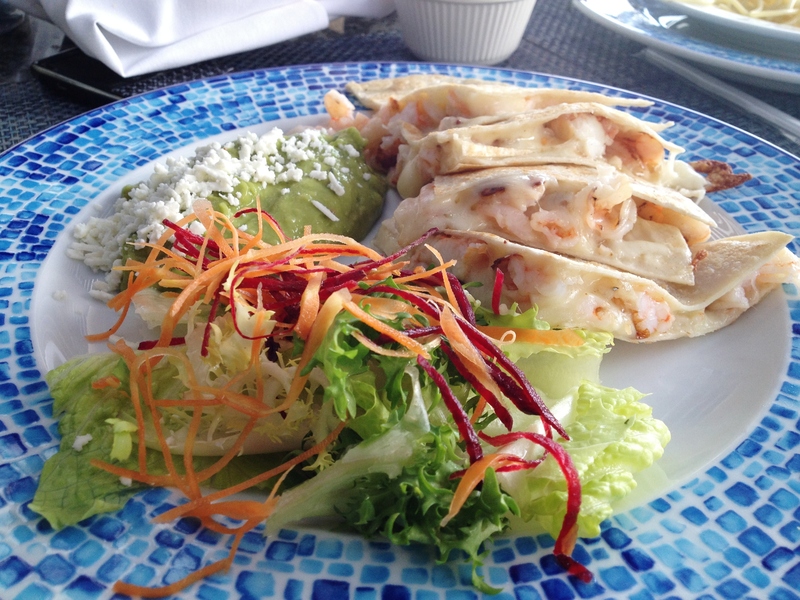 Because, you want the best lunch by the pool and the beach or between the pool and the beach in Cancun.